NEWARK, N.J. -- Martin Brodeur's 1,000th NHL game was one he'd rather forget. Brodeur became only the second goaltender in NHL history to reach the 1,000-game mark, but he was outplayed by Philadelphia's Ray Emery as the Flyers made it two wins in two nights by routing the New Jersey Devils 5-2 Saturday night. Things got so bad for Brodeur that the sellout crowd of 17,625 at the Prudential Center offered a sarcastic cheer for Brodeur he made a routine save with the Devils trailing 5-1 midway through the third period. It was obviously an off-night for the winningest goaltender in NHL history, who stopped just 22 of 27 shots. "It was a disappointing game and, really, we didn't play a solid game from top to bottom," Brodeur said. "These guys played well and were on the puck constantly. I thought Emery played very well at key stages early in the game and didn't give up anything on the power-play. They were good but we feel that we didn't play the way we needed to play." In contrast, the Flyers are doing just that. They rolled over the Devils in New Jersey one night after opening their season with a 2-0 win at Carolina. Ray Emery, who signed with the Flyers after spending a year in Russia, outplayed Brodeur and won for the second time in two nights. He made 24 saves. "It's certainly the type of start you hope for but you can't really predict anything," Emery said after leading the Flyers to a 2-0-0 start on the road for the first time in team history. "You just want to have a good game and get off to a good start. We're playing well and we're healthy." Emery was 10:16 away from back-to-back shutouts before Brian Rolston scored midway through the third period. "I was never thinking shutout but thinking we still had the lead and I wanted to help us keep that lead," Emery said. "I don't care if I win 10-9 or 1-0, it's all the same when you win." 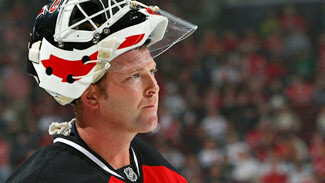 NEWARK, N.J. -- New Jersey Devils fans can take solace in the fact that goalie Martin Brodeur will have better days. Brodeur's 1,000th NHL game turned out to be one of the worst nights of his career. He was beaten on some stoppable shots and made just 22 saves in a 5-2 season-opening loss to Philadelphia at the Prudential Center on Saturday night. By the later stages of the game, the sellout crowd of 17,625 was letting him know what they thought of his performance. It was a rare off-night for the winningest goaltender in NHL history. "I really can't pinpoint one thing out there, but they got close in on me and had a lot broken plays where they scored on post and stuff like that," Brodeur said. "It's hard to gauge exactly what happened. But I can tell you that the pucks I was fighting went in tonight. I thought I was in good position on a few and maybe there were others where I wasn't." While his counterpart at the other end of the rink, Ray Emery, was winning for the second time in as many nights, Brodeur struggled to find his groove in his NHL-record 15th consecutive opening-night start. Even Emery, who's been brilliant in back-to-back wins over Carolina and New Jersey, was surprised. "It's a challenge no matter who's in net at the other end," said Emery, who made 24 saves. "But it was pretty special to have an opportunity to play against Marty. He's a great goalie. This is a team game so it wasn't me against Brodeur. Our team won tonight." Devils coach Jacques Lemaire knows Brodeur will have better days. "It wasn't really his best game," Lemaire said. "It's kind of tough for him. He got a couple of easy goals on him and after that, he was maybe questioning himself a little bit. But hey, it's one game, no big deal." Devils star Zach Parise was disappointed with the effort of the entire team. Parise was particularly concerned with a stagnant power play that produced just one goal in six tries. "We just didn't get any good scoring chances," Parise said. "That was ugly; it was very ugly. We're going to have to look at it and see what went wrong. We just weren't sharp on (our power play)." Brodeur, who entered Saturday's tilt with a 9-3-2 record, a 1.88 goals-against average and .928 save percentage on opening night, felt the Flyers' ability to kill off a pair of two-man disadvantages in the first and second periods was a turning point. "They got more momentum when they killed off those power-plays and once they got on the board, they were a tough team," Brodeur said. "We couldn't score on our power play, then they get back, they score a goal and from there it just kind of went south on us." Philadelphia opened the scoring with 4:03 left in the first when Jeff Carter skated into the left circle after taking a feed from Scott Hartnell and attempted a backhand pass to Danny Briere cruising down the slot. The pass hit the skate of Devils defenseman Johnny Oduya and came right back to Carter, who scored his second of the season into the far corner. The Flyers' penalty-killing unit continued its mastery this season after going 8-for-8 against Carolina by denying the Devils on a pair of two-man disadvantages in the first and second periods. In the first, the Devils were given a two-man advantage midway through the opening period but were held to a single shot after Carter was whistled for hooking and Hartnell for cross-checking at 9:49 of a scoreless game. Chris Pronger was in the box for interference late in the opening period when Emery made his best save of the game off a point-blank tip in the slot from Travis Zajac with less than 25 seconds remaining. That advantage became another two-man edge for 33 seconds at the start of the second when Emery was called for delay of game, but the 27-year-old continued his impressive display between the pipes. "He's been outstanding for us but it hasn't been surprising because he played the same way in the preseason so we knew what he was capable of doing," center Blair Betts said. The Flyers took control in the second period when Ian Laperriere beat Brodeur at 9:20 and Mike Richards scored at 15:23. Darroll Powe's harmless-looking shot sailed past Brodeur at 7:34 of the third period, and after Rolston scored at 9:44, Matt Carle scored on another stoppable shot at 11:13. Brodeur, who surpassed Terry Sawchuk and Patrick Roy with his 15th straight opening-night start, knows the team will learn from this defeat. "It's one game and we'll learn what didn't work and what we need to tweak," he said. "You can't dwell on this performance. You just have to move on because we have the Rangers coming to town on Monday so we just have to move on." Devils captain Jamie Langenbrunner, who scored the game's final goal, knows Brodeur will bounce back. "I don't think we'll ever question him and he'd be the first to say it wasn't his best, but we all have to be better," Langenbrunner said. When asked if he was surprised that his team was able to score five times on Brodeur, Richards admitted he was "a little bit surprised." "But it's not going to happen all the time so we'll just enjoy it now and move on," Laperriere said. Laperriere's first goal as a Flyer midway through the second came on a left circle rocket that beat Brodeur to the long side. "I'm here to help any way I can," Laperriere said. "It's not the first time I scored on Marty, but, usually, if I don't know where it's going than there's a good chance that Marty won't know where it's going either." Middletown, N.J. native James van Riemsdyk, the No. 2 pick in the 2007 Entry Draft, had two assists for the Flyers and was named the game's third star. "It was cool playing in a place like this and coming back to New Jersey," van Riemsdyk said. "I'm sure there were a little over 100 members of my family and friends here, but I'll have to check the numbers."